Charlie always wants a bite of what we’re eating, even if he has his own portion of the same food in front of him. He especially likes stealing licks of ice cream and sharing trail mix with his dad: Luke eats the nuts and chocolate, Charlie gets the raisins. (He likes these salted raisins a lot more than the “regular” ones.) Of course, he likes to offer his own food to us as well. 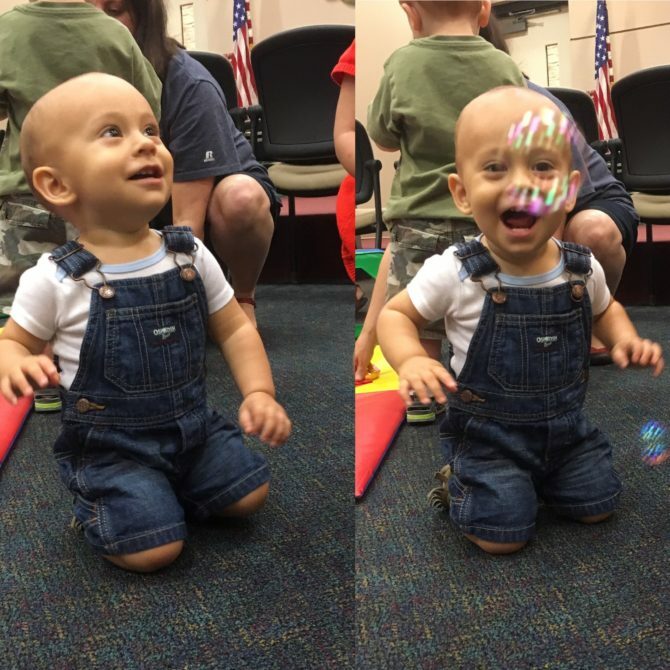 Before he started walking, Charlie didn’t show much interest in the bubbles the librarian blows at the end of story time, but now that he can chase them it’s become his favorite part of going to the library. This chair was my dad’s when he was young and was passed on to me when I was born. Now it belongs to Charlie and he enjoys climbing into it for a few minutes each morning. Sometimes he’ll bring a book or toy with him, but mostly he just likes sitting. My brother and sister-in-law gave this vTech Sit-to-Stand Alphabet Train to Charlie last Christmas, and it’s now his favorite toy. I’m not usually one to go for “loud” toys, but even I have to admit that this one is really cool: it has all sorts of fun buttons, sounds, and songs and can be pushed or ridden. Charlie especially likes the caboose filled with alphabet blocks, and I like that this toy is educational as well as fun. 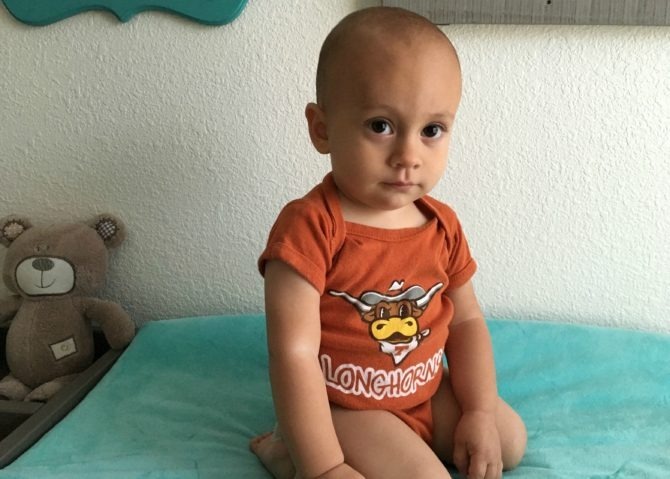 I had a breastfeeding goal of one year and figured we would play it by ear after that. 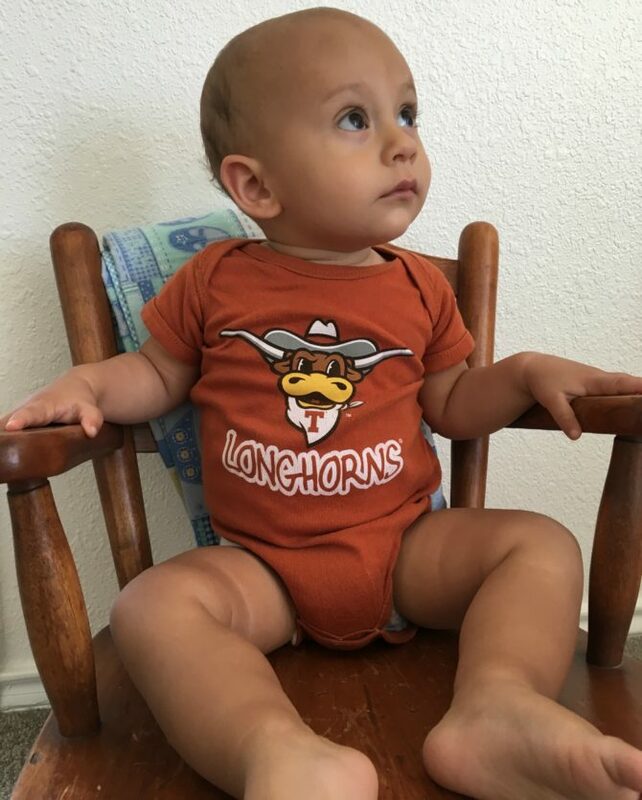 Four months later, and Charlie loves nursing even more than ever before. 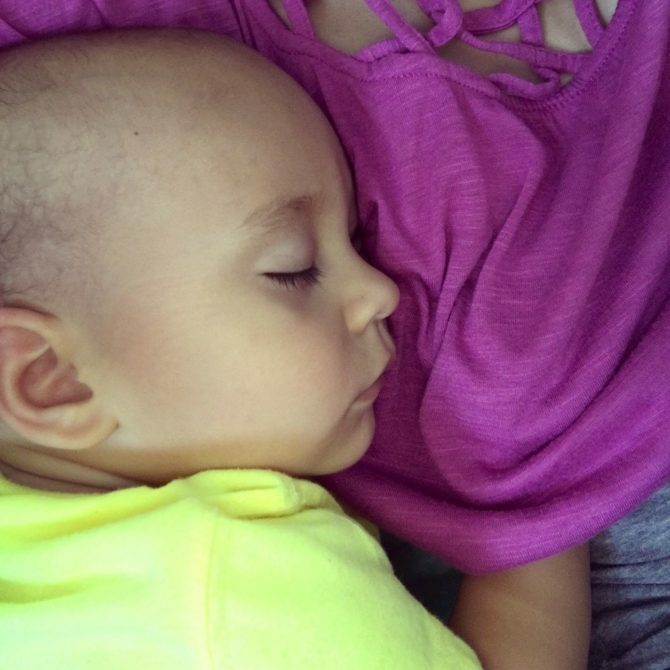 I treasure our nursing sessions, and have to admit that breastfeeding a toddler is much easier now that he can do so much of the work himself. 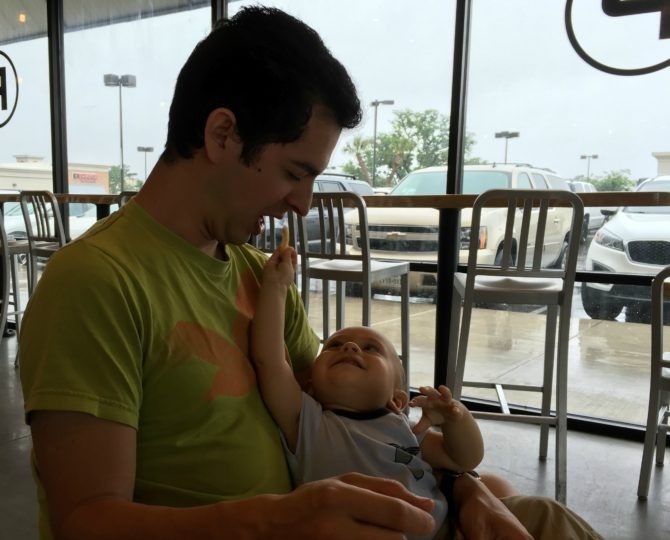 There are a few drawbacks though: it’s not pleasant to have his hand up my shirt when we’re in public, and I worry that he isn’t learning any other methods of self-soothing. 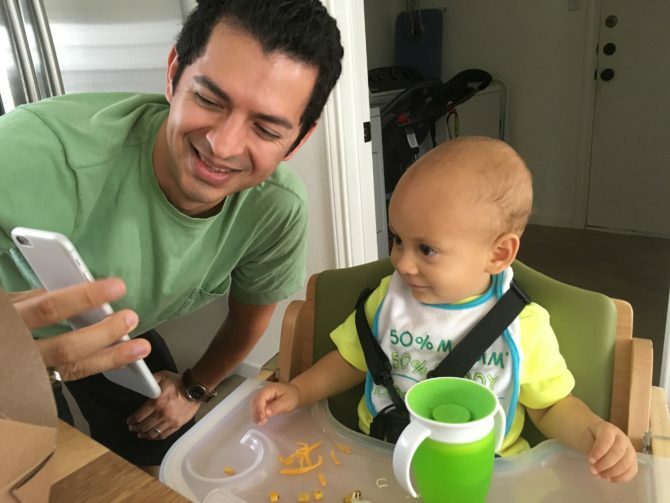 At his last check-up, our pediatrician advised us to cut back on feedings because it seems to be interfering with his appetite for solid foods, so it’s possible that our breastfeeding days might be numbered. 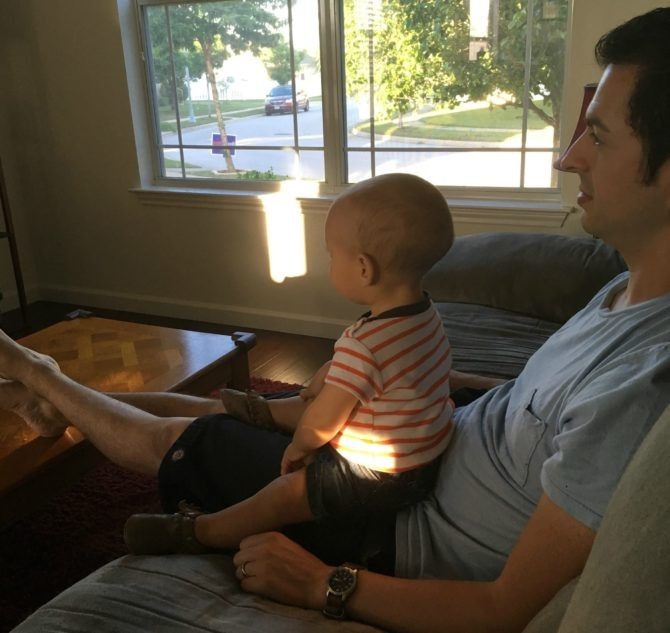 Though he usually shows little interest in television, Charlie does enjoy watching Phineas and Ferb with Luke. His favorite part is the theme song! They generally watch part of an episode while I’m making dinner and they look so cute on the couch together. From drinking it to playing in it, this boy sure does love his water. 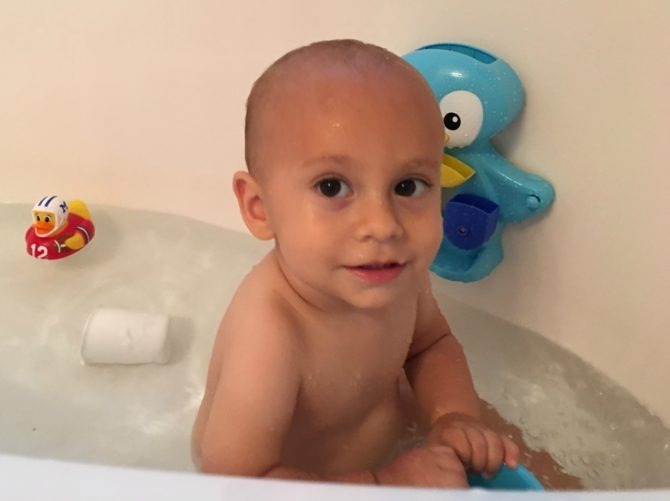 I’m looking forward to spending lots of time with him in the pool this summer. I love how much this kid enjoys his books. He understands when I tell him to “go get a book” and he’ll either bring it to me and sit in my lap for a story, or take the book over to his little table to read it himself. 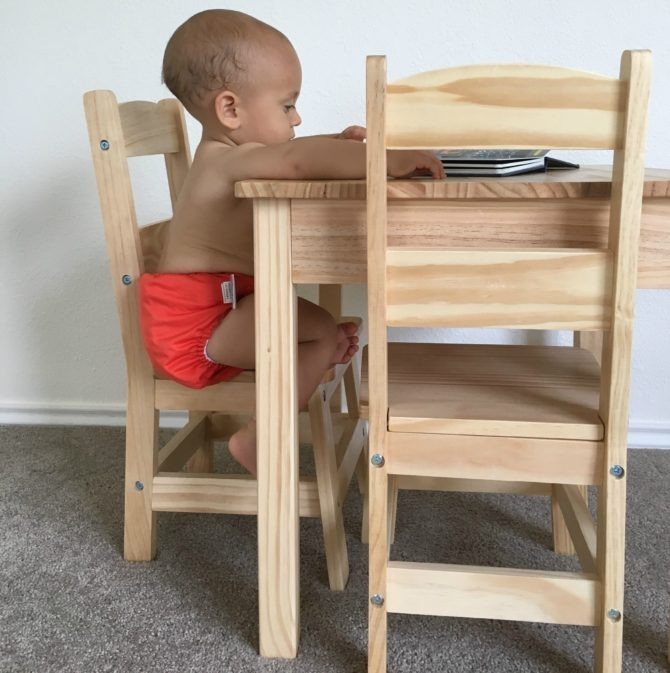 At this point he’s definitely more into turning the pages and sucking on the corners than actually reading the words, but it’s a good start! 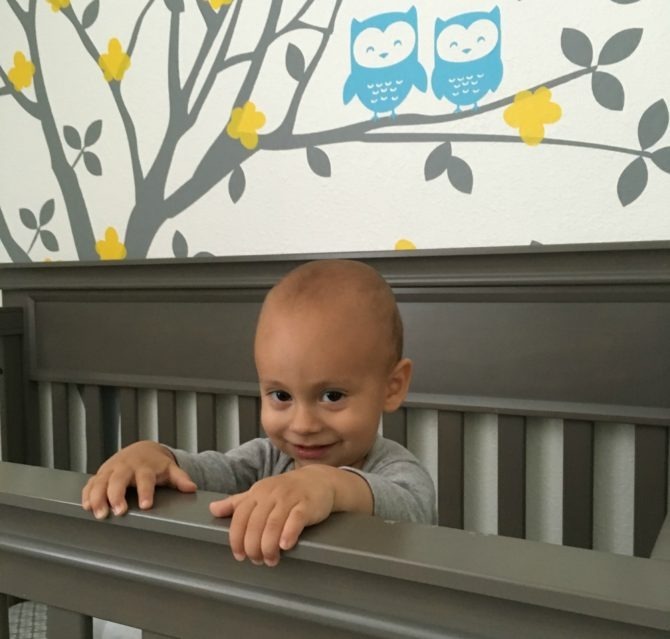 His current favorites are books that are interactive in some way: the Thomas Book that plays music, the Bunny Bible with a stuffed bunny as the cover, and the Star Wars books with buttons that “teach” how to speak droid and wookie. He imitates the sounds quite well and we joke that R2-D2 speak is his first language. 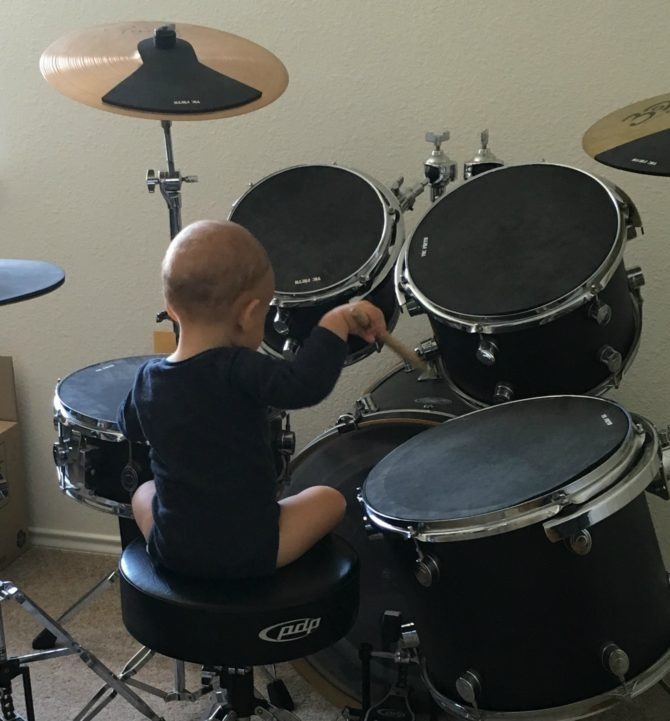 We finally have space to set up Luke’s old drum set and Luke has taught Charlie how to hit the drums with the sticks. The two of them have jam sessions every afternoon, and Charlie’s gotten pretty good! The only problem is that the drums are in Luke’s office, and Charlie wants to go in there during the day to practice while Luke is working. I often give Charlie my keys to occupy him while we’re out shopping, and now he thinks they’re his. 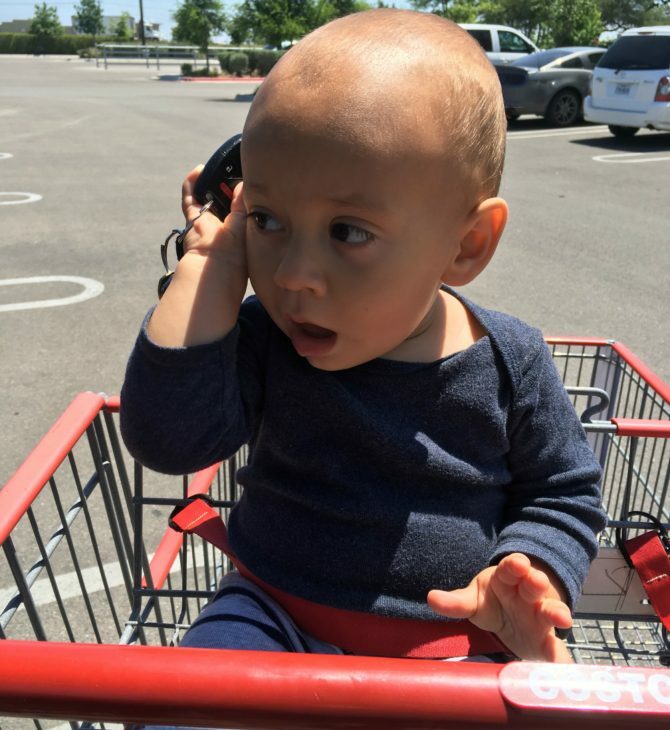 He always holds them up to his ear, like they’re a phone. I have no idea where he got that from but it’s cute, and it’s better at the ear than in his mouth! 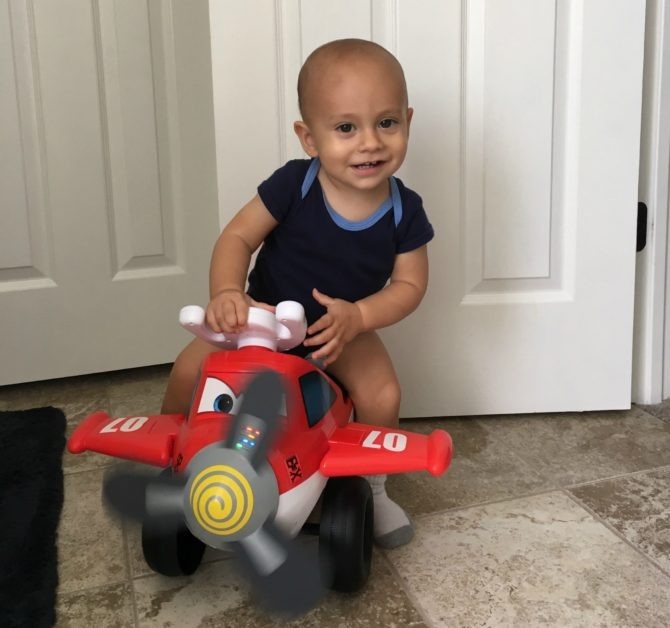 My in-laws bought this ride-on plane for Charlie before he was born, and we’ve been giving him rides from the time he could hold up his head. 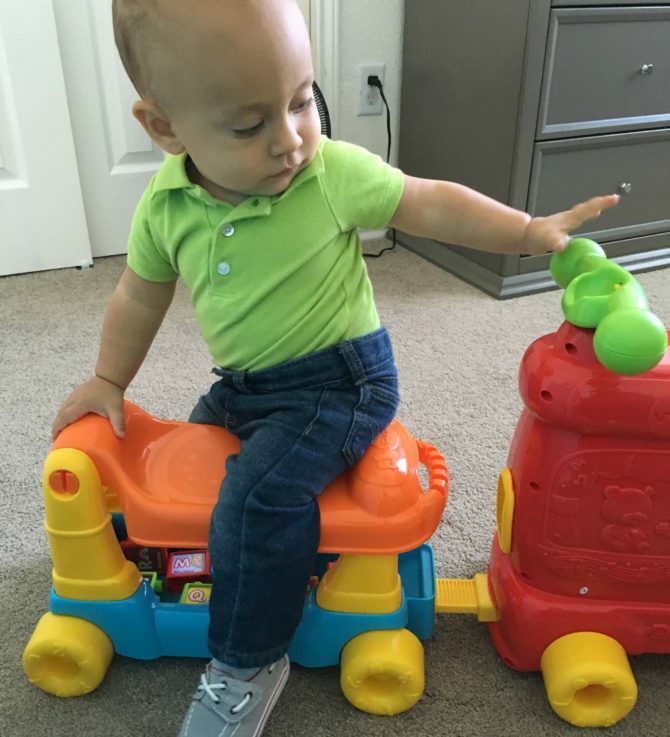 I love that he’s now able to push and ride it all on his own. He really likes the music it plays and always bobs his head up and down to the beat. Luke’s brother is a pilot and we’re all not-so-secretly hoping Charlie will follow in his uncle’s footsteps. Charlie first discovered stairs at my parents’ house, back before we had a set of stairs of our own. For the longest time we couldn’t keep him off of them: he would climb them all day long if we let him! 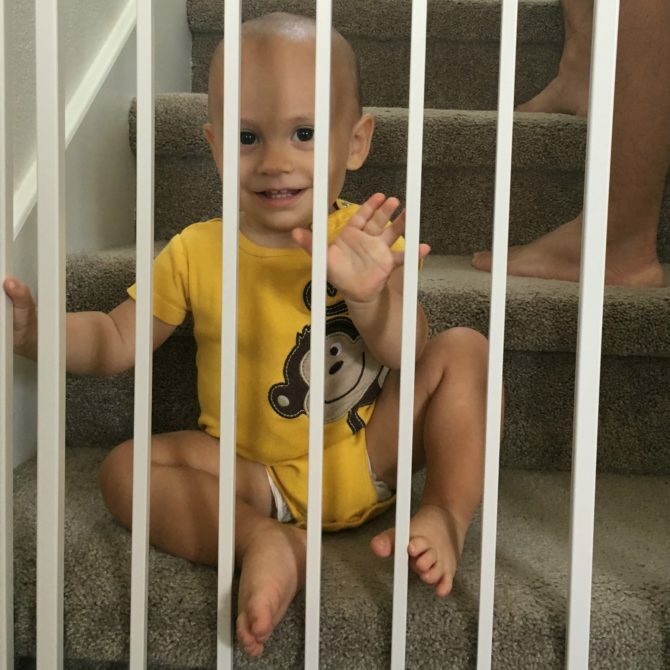 Now he still loves being on the stairs, but not climbing them: he just likes to help us open the gate, then plop down on the top or bottom step. We usually have to carry him on the stairs now because if it were up to him he would sit there forever. I don’t know that I understand the draw, but I’m glad he seems to have found his happy place. When I was growing up, my Dad and I would have our deepest conversations during “step time” and it seems Charlie and I will be continuing this tradition. We have a few kid games on our phones and on the iPad that Charlie occasionally plays, but he’s often content just holding the objects themselves, even if they’re turned off. 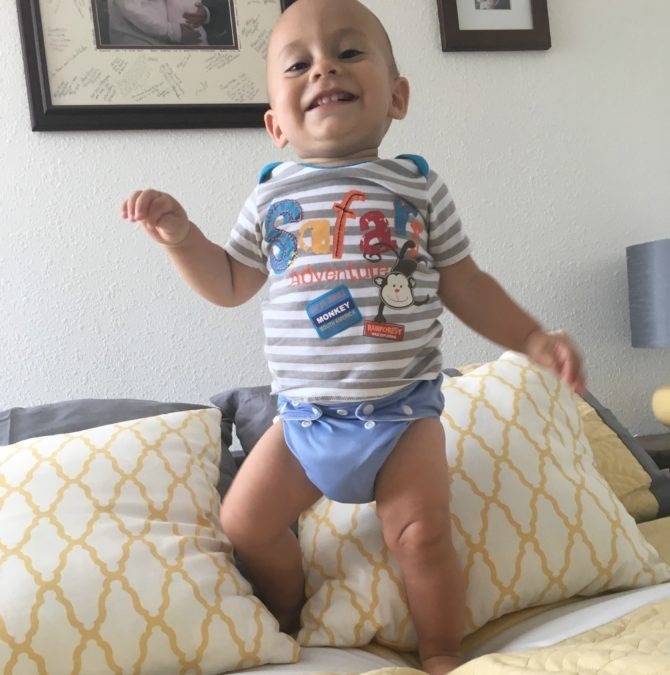 He’ll carry the iPad around the house like it’s his most prized possession, and it’s not uncommon for him to try to pull our phones out of our hands so that he can hold them. His favorite thing to do on the phone is watch videos of himself. I just hope we aren’t creating a little narcissist. . . .
We received this cute teddy bear as a baby shower gift, and he sits on Charlie’s changing table to console him during dreaded diaper changes. Charlie usually cuddles Xavier to his chest for a while, then flings him across the room, only to go searching for him later. 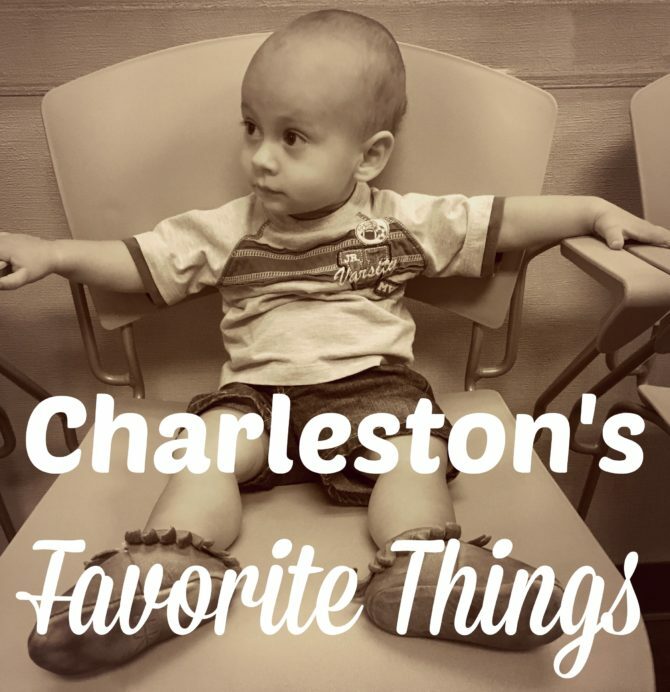 It was so hard to narrow Charlie’s favorites down to just 16! Other favorites that could have made the list include: carrots, straws, toilet paper (eating it, pulling it off the rolls, etc. ), helping Mom clean, sorting laundry, nut butters, having his bald little head brushed, bananas, getting his temperature taken (really! ), and the always-popular pulling clothing out of drawers!